This is the place where I was born, and this is the story of my family. My great grandfather Guglielmo, moved here from via San Nazaro, a nearby street. In 1928, he opened the Osteria Carducci, a small tavern or Italian “Osteria”, that was half of the original size of today’s restaurant. The small kitchen was in the Osteria’s back-room. At that time, they served, in addition to good wine, a few simple warm dishes. The street led directly to the city center, located across Umberto I bridge, which today is called Ponte Nuovo. In 1936, my grandfather Piero took over the tavern’s management. Here in the osteria is where he and my grandmother Ida raised their 5 children. My father was born in the adjacent bedroom, where today, a book case stands. Their life most likely unfolded for the most part in this very room. After World War II, the family purchased the apartment above the tavern, in spite of financial hardship, and moved there to live. That is to where the “mysterious” spiral staircase leads, about which my restaurant guests so often ask me. My father Pier Luigi took on the legacy of the family business in 1970. He probably did so reluctantly, considering he was not meant for the job. Nonetheless, it was a secure job, which would eventually allow him and my mother Maria Pia to raise their four children. He called the place “Bar Carducci”, and the old bar sign is still kept inside our restaurant today. I am Stefano, the youngest child. Because of my vivacious and rebellious nature, I would have never thought to take over the family business that my parents had been building for many years, not without sacrifice. But when I turned 30, the natural inclination in my DNA eventually emerged. 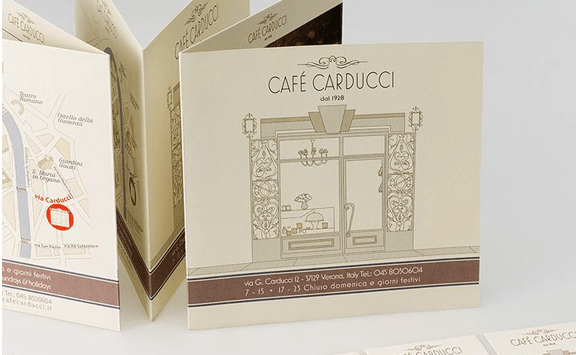 In fact, when my father decided to retire from the business back in 1999, I was ready to take over, and at the same time, changed the bar’s name to CAFÉ CARDUCCI. Not only did it become a coffee bar, but also a rendez-vous spot for tasty aperitifs and refined wine-tasting. The latest change undergone by the Café, but not the least important, was its renovation in 2012. The architect and close friend of ours, Mario Santini, led the project. I decided to recreate the former flavor and splendour of the Café, built up over its 40 year-long history. The greatest achievement of the remodel is the exhibition kitchen, now visible to the Café guests. From 2017, with pride, Café Carducci is part of the Locali Storici d’Italia Association, with the superintendence of the Ministero dei Beni Culturali. Today, for me and my wife Benedetta, conviviality, good food and excellent wine are not only our passion, but also our life. The right paper for our brochure has been chosen through a sophisticated selection, whose intent was to emphasize the “food element”. CRUSH paper by Favini incorporates organic residues that inspire the natural range of colors, citrus fruits, corn, olives, coffee, kiwi fruits, hazelnuts and almonds. Content includes 30% post-consumer recycled waste. This is why we strongly wanted this paper! See how CRUSH by Favini is produced.